The LPSC series of transmitters are powered by the 4-20mA loop and accept all types of inputs and provide a varying analogue output of between 4 and 20mA. The LRS / LRD series of modules provides isolation between two analogue loops – typically 4-20mA loops, they prevent “ground loop” circulating currents. The TSC and TSCT range provides signal transmitters with 3 way isolation, from 24vdc to full Mains Power. The input can be any standard instrument type – TC, RTD, VC, Slidewire and the output either standard single zero base or bi-polar meaning from minus thru zero to plus. 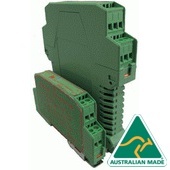 This range covers Analog trip modules, monitors for brake motors and conveyor start-up monitors. Bourdon-Haenni by Baumer is the industry standard for Pressure Gauges along with an extensive range of Pressure Switches and transmitters. Transtech represents FEMA Electronica of Spain who specialise in Panel Meters, Large Displays - Time Format & Bar Graphs.